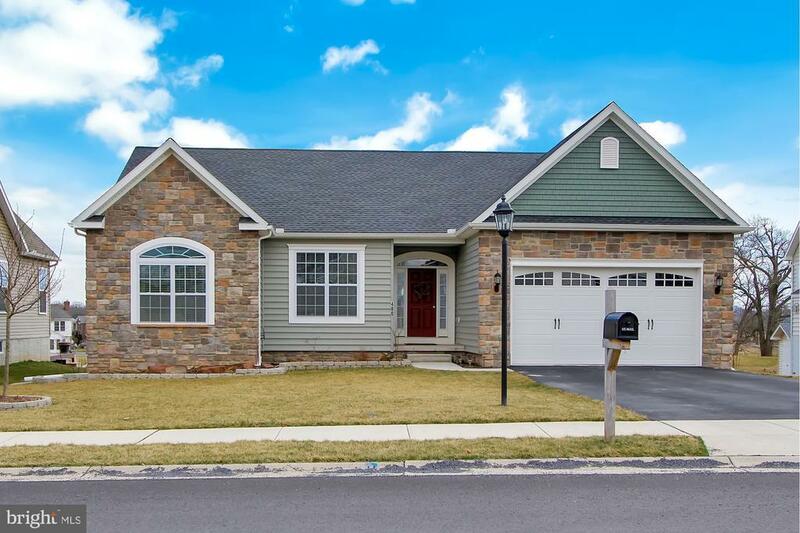 This lovely 3 bedroom stone and vinyl sided rancher is located in Cumberland Village. It has been elegantly appointed throughout from the spacious room sizes to the vaulted living room with a gas fireplace. Gourmet kitchen including granite countertops, SS appliances, as well as a beautiful Sun Room with access to a 33x22 rear deck and fenced yard. There is oak hardwood flooring from the foyer through the living room, kitchen and hallway. There is over 1, 720 finished square feet, as well as a partially finished lower level which offers a family room, gaming area, as well as office and craft area. Great commuter location, just minutes to Rt. 15 or Rt. 97. Dont miss this one! Directions: From Gettysburg take Middle Street to Right on Fairplay Rd, Right on Friendship. HOA Name: The Lands At Cumberland Village Homeowners Assoc.